Serchhip constituency in Mizoram's central district of Serchhip would be one of the most interesting seats in the coming elections to the 40-member state Assembly to be held on November 25. Four-time Chief Minister Lal Thanhawla, who would be contesting from the seat, would be facing a tough contest from C Lalramzauva, an advocate and common nominee of the Mizoram Democratic Alliance (MDA). Lal Thanhawla had contested and won six times from this seat and lost only once in 1998 to a retired engineer K Thangzuala of the Mizo National Front (MNF). This time, MDA, the three-party alliance of the MNF, the Mizoram People's Conference (MPC) and the Maraland Democratic Front (MDF) is trying to repeat the 1998 debacle of the Chief Minister. In 2008, Lalramzauva, who contested the polls from Serchhip constituency on a Zoram Nationalist Party (ZNP) ticket, lost to Lal Thanhawla by a margin of 952 votes and by a margin of 1399 votes in 2003. Lal Thanhawla would also contest from Hrangturzo constituency in Sechhip district, which was being occupied by Lalthansanga of the MPC, now a common candidate of the MDA. Another interesting seat would be the East Tuipui in Mizoram-Myanmar border Champhai district where former chief minister Zoramthanga of the opposition MNF was pitted against a retired senior bureaucrat T Sangkunga of the ruling Congress. Till recently, Sangkunga was the president of the powerful central committee of the Young Mizo AssociationP C Zoram SanglianaLalchamliana (YMA), the apex Mizo body. Zoramthanga, the two-time chief minister and former underground leader, had contested and won from this seat in 1998 and vacated the seat in favour of his close aide K Vanlalauva as he also won from Champhai seat, his home turf. A battle royal is exptected in Kolasib seat along the Assam border district of Kolasib where the ZNP chief Lalduhawma was pitted against state transport minister and Congress nominee Young Mizo AssociationP C Zoram SanglianaLalchamliana and former Speaker Young Mizo AssociationP C Zoram SanglianaLalchamliana of the MDA. B Sangkhumi, a former head of Mizoram's apex women's body Mizo Hmeichhe Insuihkhawm Pawl (MHIP), is set to contest as an independent from Champhai South constituency. The wife of former adviser to then chief minister Zoramthanga of the MNF, Sangkhumi is among only three women who will contest in the November 25 Mizoram Assembly elections, where female voters outnumber males. Upset at not finding a ready market for ginger, a farmer in Mizoram's Sialhawk village has not shaved for 15 years after pledging not to do so until the Zoram Nationalist Party, led by former MP Lalduhawma, comes to power. Biakvela, 63, was once a local unit leader and staunch supporter of the Mizo National Front, which ruled Mizoram between 1998 and 2008. "I had hoped my old party would buy the ginger from farmers like us but it did not take up any such policy," Biakvela says. "In a fit of rage, I turned in my party seal and books and joined the ZNP, which promised to frame such a policy for farmers. Soon afterward, Lalduhawma welcomed me into the party with a small ceremony just outside my house, where I pledged I would not shave until the party comes to power." It has been a long wait since then because the ZNP, formed by former IPS officer Lalduhawma after he left both the Congress and the MNF, is a small party, the only active one in the state that is yet to form a government although its chief has been ahead in opinion polls asking people about their most preferred CM candidate. Though the most pre-poll noise appears to be emanating from the ZNP this time and most Mizo youths appear to be leaning towards the underdog in state politics, the party's reach can be gauged from the fact that many of its candidates — some of whom are bureaucrats, academics and Christian youth leaders with good reputations — are political rookies, some of them given tickets the same day they joined the party. A recent photo of Biakvela with Lalduhawma's arm around his shoulder was flashed by ZNP leader Rothuama Sailo on Facebook recently, and the farmer suddenly found himself famous although many comments on the site have poked fun. "Rothuama put the picture, which was taken when Lalduhawma came to Khawhai sub-town during a recent campaign trip, on Facebook. I have seen some of the comments. Some are saying I will never shave my beard because the ZNP will never come to power, some are saying I will have to wait for many more years while some say I will shave this year," Biakvela says. He admits he has been taunted a lot by fellow-villagers, friends and family. "I made a pledge and, well, a pledge should not be broken. So every time I get taunted I just scratch my head and say, well, maybe this year is the year God ordains as the year I shave," he says, laughing over the phone. Biakvela has over the years risen in the ZNP ranks, and he is currently one of two vice-presidents of the party's block unit in the southern part of Tuichang constituency, represented by Mizoram's controversial health minister Lalrinliana Sailo. With his party still having never tasted power, however, he remains a farmer although he admits he is too old to grow ginger, one of Mizoram's most important crops, and usually fishes in ponds using a net. His ginger crop anyway rotted two years ago after he was unable to find a market for it, and he was unable to plant any more due to his age and also because he could not find seeds even in the forests. His son, Lalthlamuana, is a carpenter who owns a small furniture shop in Champhai town, the district headquarters. He has promised his father he will close down his shop, come home and plant ginger in their farm once again if the ZNP, which promises to buy farm produce through a robust policy, comes to power. All parties in Mizoram have announced their candidates for the elections to the 40-member state assembly to be held on November 25. All parties in Mizoram have announced their candidates for the elections to the 40-member state assembly to be held on November 25. The ruling Congress is contesting from all 40 seats while the main opposition party, the Mizo National Front (MNF), is contesting from 31 seats with its pre-poll allies the Mizoram People's Conference (MPC) and the Maraland Democratic Front (MDF) contesting eight and one seats, respectively. The Election Commission is fully prepared for the upcoming polls to the 40-member Mizoram Assembly scheduled for November 25, Chief Election Commissioner V S Sampath said here today. 100 % updated photo electoral rolls and 100 % Electors Photo Identity Card (EPIC) by the state election department was highly commendable, Sampath told reporters. He said 94 of the1,126 polling stations are critical and special measures have been taken to keep a watch on them. "Security has been tightened and beefed up in these critical areas and along the border areas with Myanmar, Bangladesh and neighbouring states of Assam, Manipur and Tripura," he said, adding quick response teams and flying squads would be deployed with executive magistrates in these areas. During the meetings which the EC held yesterday and today, it was decided that damaged roads due to heavy rains in many places, specially in the southern districts, should be repaired on war-footing, the CEC said. Alternate communication network for interior villages where mobile network is absent would be arranged, he said, adding concerned officials have been instructed to take strict action to curb flow of illicit liquor to prevent electoral malpractices. 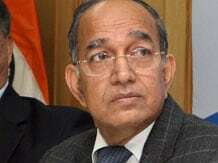 Sampath also urged the voters to come out in large numbers on the day of polling. Officials told PTI that coordination with the Assam Rifles in areas along the Manipur border and security along the 64 km long un-fenced border near tri-junction of Mizoram-Tripura-Bangladesh in Mamit district was also discussed with the EC during the meeting attended by Chief Secretary Ms L Tochhong, DGP and other senior officials today. 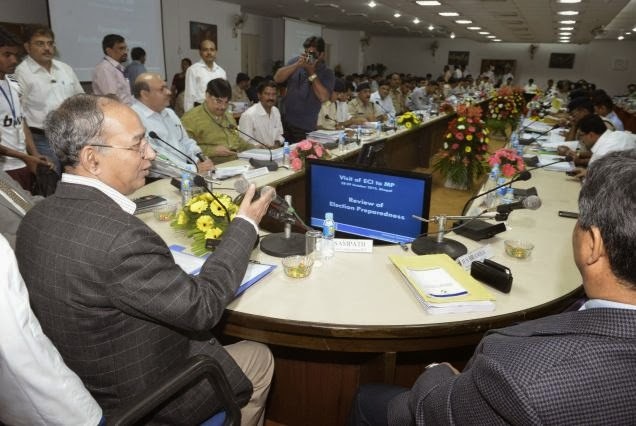 CEC Sampath, Election Commissioners H S Brahma and Dr Nasim Zaidi and top officials of the EC, who arrived in Aizawl yesterday returned to Delhi today.